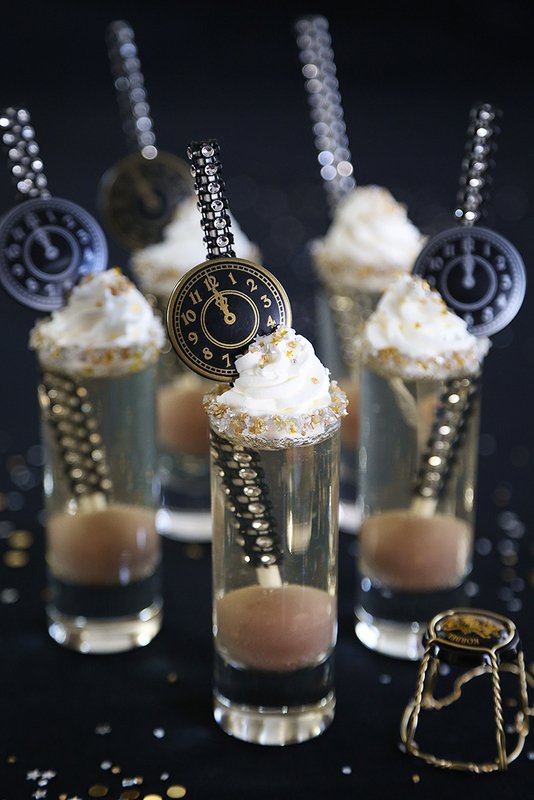 These are delicious with or without the addition of the chocolate truffle, but it's my nod to the Times Square ball drop. I used Lindt Caramel Milk Chocolate Truffles, which are so smooth and lucious. And bonus! Each truffle has a little round indention which is the perfect size to insert a lollipop stick. 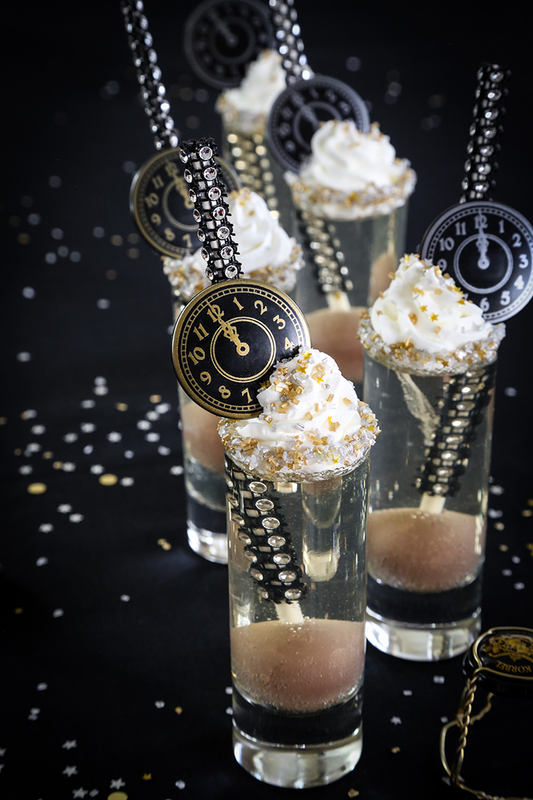 I used extra-blingy cake pop sticks (sold here) and clock cupcake toppers (here) for extra pizzazz. Any small shot glass can be used here, but the 2.5 oz. 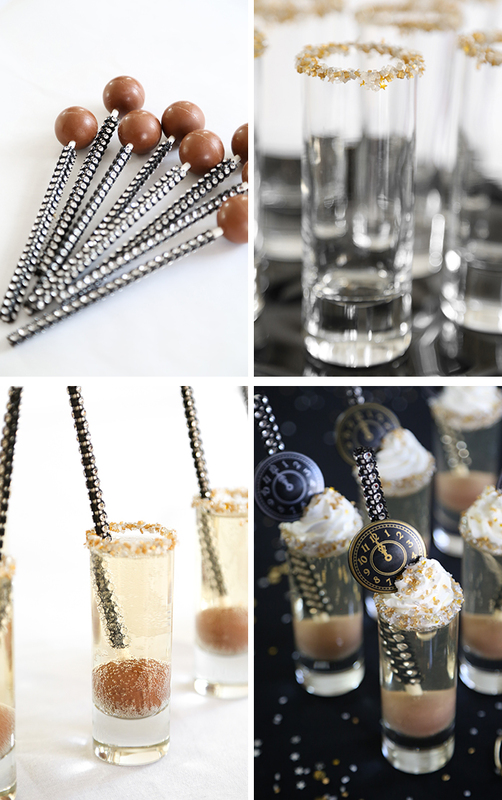 dessert shot glasses with accompanying spoons I used can be purchased here. Most recipes for champagne jelly call for the spirit to be heated, and this causes some of the alcohol to evaporate. This recipe is a little different - and boozier! It relies on a mixture of bloomed gelatin and prepared simple syrup. 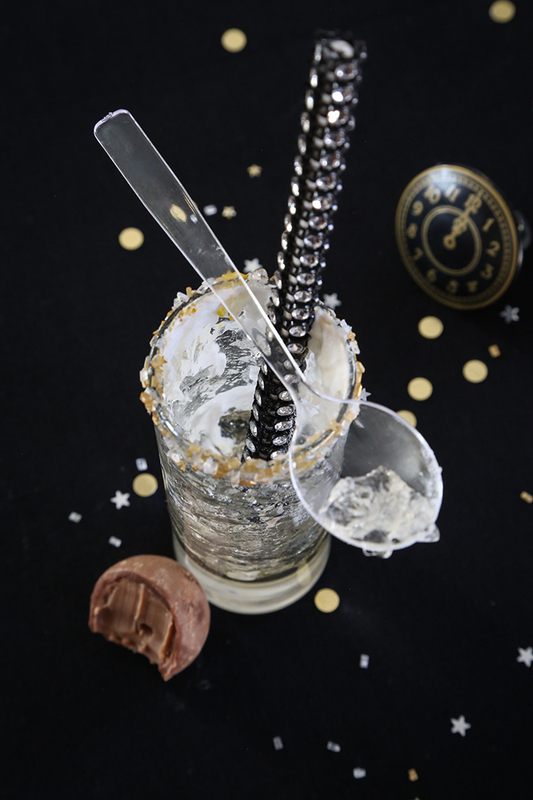 The champagne is added to this mixture after the syrup cools, and the result is a sweet, potent little dessert worth a midnight toast! Thank you, friends, for a wonderful 2017. 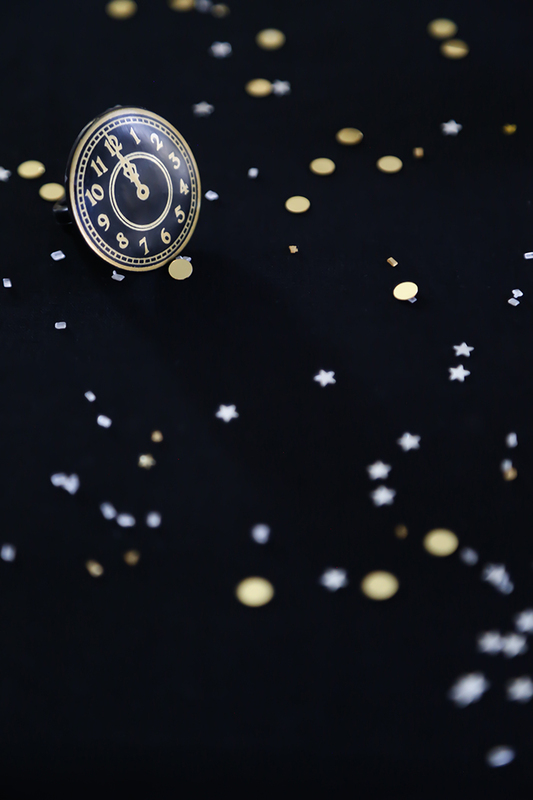 I wish you good health, whatever is meaningful, whatever is good and whatever makes you happy in the New Year! These little gelée shots are delicious and potent. They are softer set than a jello shot, so don't expect a firm texture. The gelee and truffle portion can be assembled and made ahead; cover with plastic wrap. I recommend topping the glasses with chantilly and garnish just before serving. Insert a pop stick into the indention in each truffle. Set aside. Pour a little corn syrup or piping gel into a small shallow dish. Pour sugar into a separate shallow dish. Lightly dip an index finger into the corn syrup and run it across the rim of each glass. Dip into sugar. 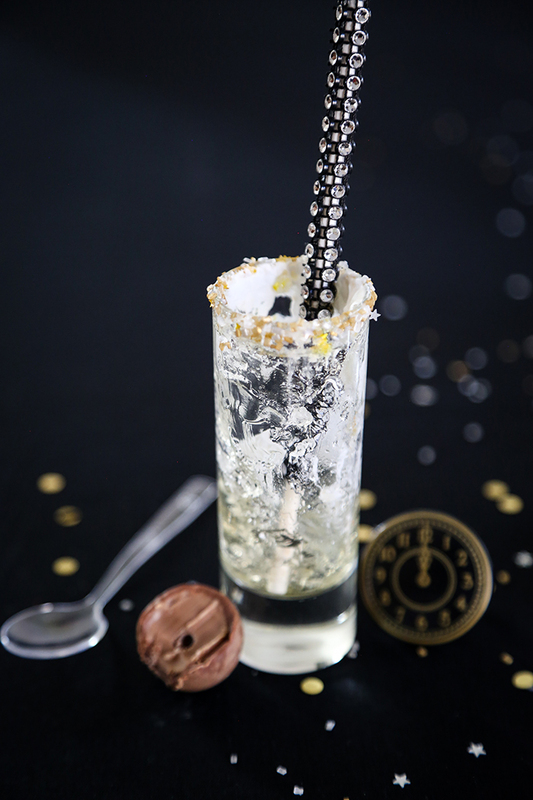 Let sugar rimmed glasses stand at room temperature while the rest of the recipe is prepared. Set eight 2.5 ounce shot glasses in a baking pan or on a tray. Pour the water into a small saucepan. Remove two tablespoons of the water to a small condiment cup and sprinkle the gelatin over the surface. Let stand until bloomed and fully set. Add the sugar to the saucepan. Cook on medium-high heat until the sugar completely dissolves, about 5 minutes. Remove from heat. Stir in the bloomed gelatin. Mix until the gelatin is completely dissolved. Let the simple syrup mixture further cool until just warm. Add the champagne and mix well. Pour the champagne gelée into each glass. Transfer the glasses to the refrigerator to chill for 2 hours. In a medium bowl, beat heavy cream with an electric hand mixer until soft peaks form. Gradually add sugar and beat until stiff peaks form; add vanilla and beat again. Transfer mixture to a piping bag fitted with a star decorator tip. Pipe whipped cream into each gelée. Garnish with more sparkling sugar. I made these last night for New Years, they were amazing! But how did you get the Lindt balls to sink? Mine kept popping up to the surface! Hi Katelyn! I'm so happy you tried the recipe! Maybe the size of the glass and the lollipop stick kept my pops on the bottom? I didn't experience any bobbing truffles, but I'll attempt the recipe again with another size glass to see if it happens. Thanks for the feedback! Love these! Am going to try them with vegetarian gelatine. Your new house looks amazing. I especially love the drawers in the kitchen with the cup pull handles, the adorable front door and the fact that your house seems so roomy and light inside. Good luck with the move, and hope you'll be very happy in your new home.